After my accident in 2005 I was introduced to wheelchair basketball as a form of rehabilitation. I fell in love with the sport, and initially played for a small club in Ipswich before moving to the Derby Wheel Blazers in 2008. In 2011 the British Sledge Hockey Association approached my club, Derby Wheel Blazers to invite our squad to try out Para Ice Hockey. Up until this point I didn’t even know Para Ice hockey existed. 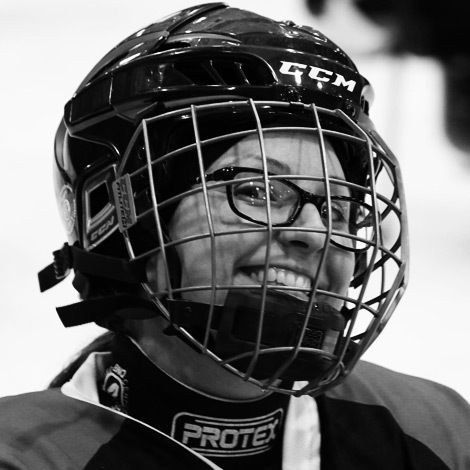 I’m always looking for a new challenge, so I went along to the taster session (even though I was still recovering from my most recent surgery), and as soon as I hit the ice, I knew I loved it. The fast pace, energy and the skill involved were perfect for me. I was invited to join the GB team and travelled to Sweden in 2011 as part of the World Championships tournament, playing in defence. 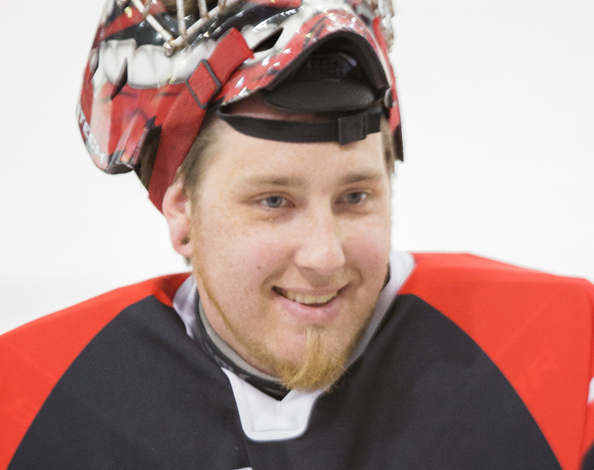 Although I enjoyed the experience, I knew I really wanted to play in goal, so when we returned from the competition, I started to train and play in between the nets, and I’ve been the GB goalie ever since. I joined Peterborough Phantoms in 2012 as one of the founding members of the club and I haven’t looked back since. I have travelled to Sweden, Japan, Russia, Holland and Italy to play for GB. My proudest moment, behind getting married and seeing my children being born, was winning a bronze medal at the World Championships B-pool in Japan in 2013. My hopes for the future are to help the sport grow and to inspire a younger generations to enjoy the sport that I also love. 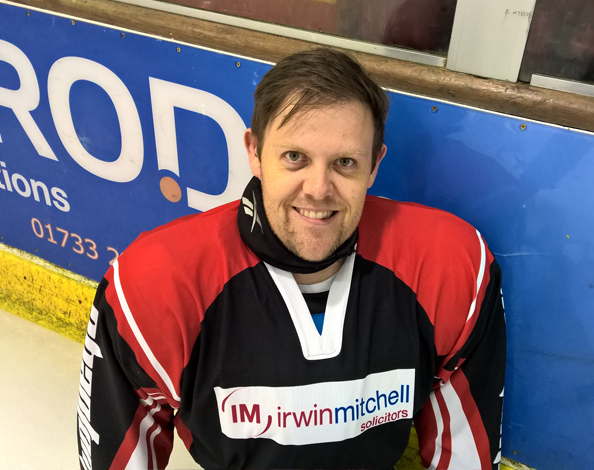 Rob was selected, with 5 other members of the Peterborough Phantoms, as part of the GB Team who travelled to Japan in November 2016 for the IPC World Championships. Disability: Osteoarthritis in ankle, ruptured knee ligaments, nerve damage to leg from compartment syndrome, post thrombic syndrome. I’ve been with the club since the Summer of 2017. I found out about the club and sport by finding them online through the Inspire Peterborough website. I wanted to find something different, and Para Ice Hockey is certainly that. I love the feeling it gives me, because it just makes me forget about my disabilities when I’m on the ice. Looking towards the future, I just want to keep getting better, because there’s so much to learn, but despite that it’s great fun. Dislikes: Cars and being hot. I have only been playing for the Phantoms since March 2017, and I found this sport by accident. I happened to be in the right place at the right time, by meeting a few of the club members at a promo event in my local Tescos. After just two training sessions I was playing in the clubs opening league game of the 2017 season ! They all seem to be good guys, and hopefully a good laugh with like-minded people, so I went along to give it a go. I missed exercising and I have always enjoyed being active and refuse to let my disabilities get in the way of my life. On the ice, we are all equal and I love getting in there and giving it my all. 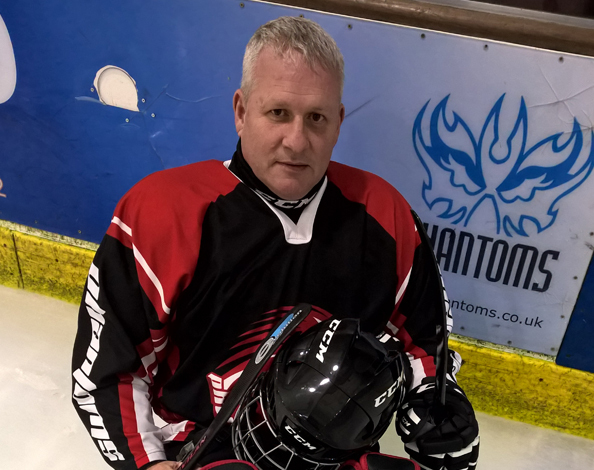 I have been playing Para Ice hockey for around 7 years, originally starting with Cardiff, and then moving to Peterborough when the team was being formed in 2011, as Cardiff didn’t have a competitive team at that stage. I played for Peterborough Phantoms for the first 2 years, and then moved to Cardiff for the last couple of seasons once they had a team up and running. However I’ve now returned to Peterborough and hopefully I’ll help them win more Championship titles. I love this game, and I’ve been hooked since I first started playing. I hope to continue playing for both Phantoms and GB for many more years to come, and to push this great sport forward on and off the ice. 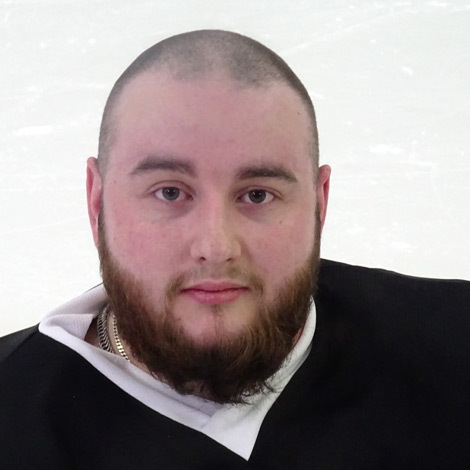 Scotty was selected, with 5 other members of the Peterborough Phantoms, as part of the GB Team who travelled to Japan in November 2016 for the IPC World Championships. I have always been active, and I used to play football around 2 or 3 times a week. In 2012, I suffered an ankle injury that prevented me from playing to the level and frequency that I was used to, and sadly this injury forced me to give it up. My girlfriend became bored of listening to me moaning about not being able to play sport, and got in touch with Peterborough Phantoms to see if I could become involved in any capacity. I turned up for my first session in early 2015, and I was instantly hooked. The speed, skill and overall challenge was exactly what I was looking for. I remember the speed that I got up to in my first training session, and I didn’t want it to end. 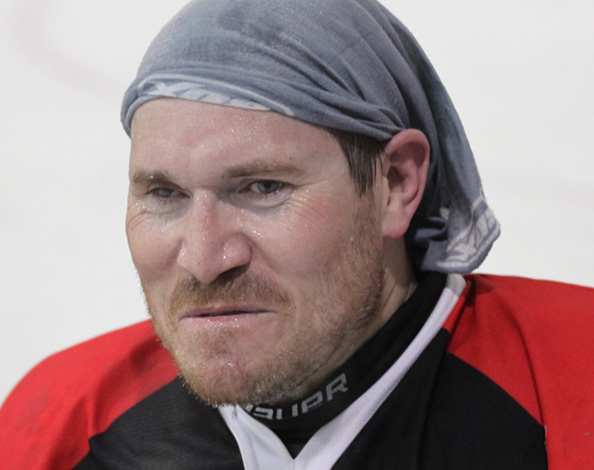 When I finally got off the ice, I was a sweaty mess, but I knew I had found my new sport. I wasn’t able to competitively play last season due to a shoulder injury, so this is going to be my first year of playing, and I can’t wait. With regards to the future, I would like to try and promote the club and the sport, to make it more accessible to people in different areas. I live in Essex, and with Peterborough being my nearest team, it would be great to see the sport develop so we didn’t all have to travel large distances to play this game. I work for a disability charity, so I see on a daily basis the benefit of new experiences, and I would love for more people to have access to sledge hockey at their local rinks. 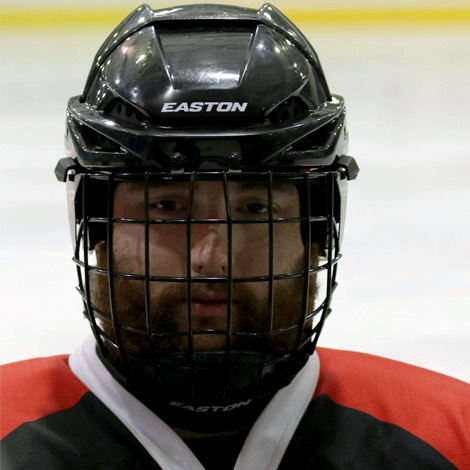 I have been playing Para Ice hockey for almost 5 years, and I was introduced to the sport by my friend, Matt Coleman, who was my team mate when we played wheelchair basketball for the same club. When I was younger I played a lot of rugby, but I lost my leg at the age of 18 meaning I could no longer play the game and I missed the physical side of the sport. Basketball was great, but with it being a non-contact sport I was on the verge of being sent off in every game because of my style of play. I missed hitting people at speed, but wheelchair basketball was the only sport I was aware of that got me as close to the experience of rugby. This all changed when Matt introduced me to Para Ice hockey and invited me to the rink to give it a go. If I’m being honest, it didn’t sound like my kind of thing – I was expecting it to be tame, and just a lot of disabled guys sliding around on the ice, however, being a friend I went along to the ice rink and squeezed myself into Matt’s sledge, and my view changed immediately. It was awesome, I could turn sharply, it was fast and best of all, I could hit people like I did when I played rugby. I went home, and watched everything I could find on sledge hockey, and I could see that this was not a sport for wimps. 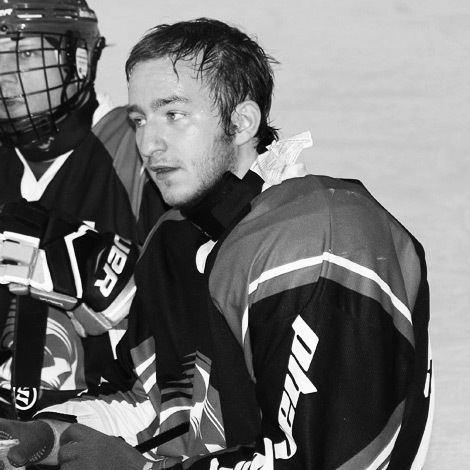 Para Ice hockey has given me everything and more. I have some great experiences of meeting new people, making great friends, travelling across the world playing for Great Britain, against some of the best players this sport has to offer. My highlights so far would include winning Bronze in the Pool B World Championships in 2013. 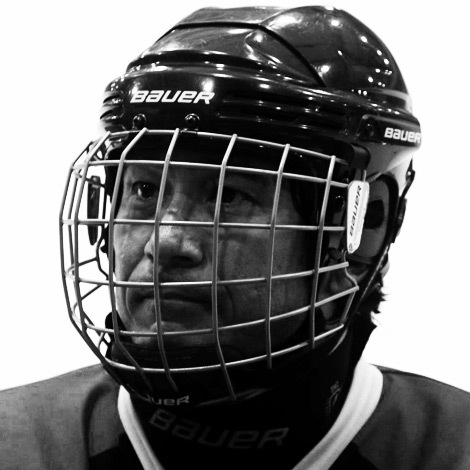 I also made it on the telly while I was in Italy for hitting one of the best defencemen in the world, it was so hard that he did a backflip – I did end up in the sin bin, so it was just like back in the day when I was playing rugby, I knew I had found my sport for sure! Darren was selected, with 5 other members of the Peterborough Phantoms, as part of the GB Team who travelled to Japan in November 2016 for the IPC World Championships. I was medically discharged from the RAF in November 2014 and before my disabilities I was very active and played field hockey to a high level. My disabilities are numerous, so where to start? Well I have spinal injury, SIJ dysfunction, hypermobility, nerve damage and mental health problems, but thankfully despite that I still have great teeth! I’m a veteran, a mother and a wife. When I was discharged by the RAF, I was in a pretty bad place mentally as well as physically. I eventually found employment, and my rehabilitation was going well, but I missed being part of a sport. When I heard Para Ice Hockey was going to be involved in the Invictus games, and having already played field hockey in my past, I thought this is the sport for me and I went along to my local team, Peterborough Phantoms. The freedom this sport gives me is beyond words, normally I have crutches or I am in a wheelchair, but being free on the ice is liberating and being able to play a physical game again, is amazing! This sport has given me joy and I can’t stop smiling when I’m taking part. I love being part of our club family and showing my daughter that no matter what life hands to you, you can do anything if you set your mind to it. I’m proud to be a Phantom! Likes: The outdoors, all types of hockey, spending time with family and friends, my pets (1 Black lab and 3 cats), Gin and stationary. Dislikes: Offal, smelly locker rooms and backstabber’s. I got into Para Ice Hockey after my wife got bored of me complaining about the lack of disability sport within Peterborough. At the time I was travelling to Lincoln regularly to play Sitting Volleyball. My wife looked online and found Inspire Peterborough, and after a quick email to them I was invited to an Inclusive Skating session, on a Friday at Planet Ice in Bretton, which I really enjoyed. I was then invited to practice with the team on a regular basis and haven’t looked back since. I have played various sports before but I am hooked on Sledge Ice Hockey, I just wish I had found the sport earlier. In my youth and younger years I would constantly play various sports in lower levels, however after being injured in the Forces, my participation in sport slowly but surely decreased. After 17 various operations I had my lower left leg amputated. After that I spent a number of years just sitting around until I saw a photo of me on my timeline on Facebook and I realised I wasn’t happy with what I saw, so started thinking then. I thought that there must be more I could do, so I took to Google and came across Inspire Peterborough. I was invited to an Inclusive Skating session one Friday at Planet Ice in Bretton to try Para Ice hockey and I loved it! All I can say is thank you Inspire Peterborough, I am hooked and hopefully I can only get better. 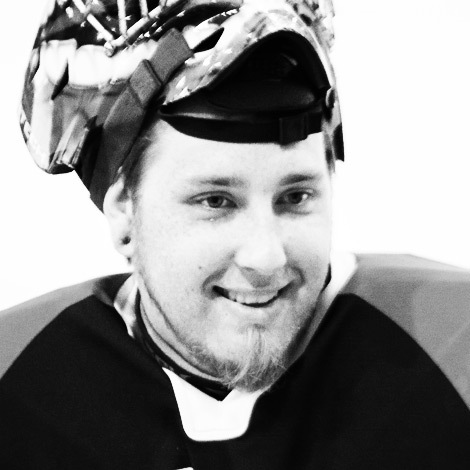 I started playing Para Ice hockey with a session called ‘bum in a bucket’ where I met Matt Coleman. I was invited onto one of the Peterborough Phantoms training sessions when I was 14 years old. Sadly, I found out I was unable to play the league at 14, I decided to give it up for a few years until I was able to officially join the Phantoms! I Iced with the Team again in early 2015 where Darren Brown and Matt Coleman took time in teaching me all I needed to know for my first season as a phantom! With every training session and all of the ice time I had, my skills improved quickly. This moved me from the side and put me into the fast paced, challenging season of 2015. 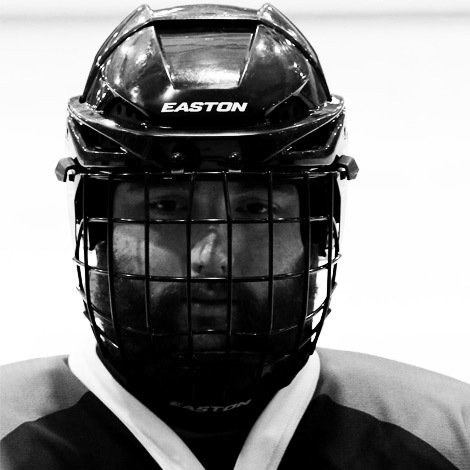 Since Icing with the team back in 2015, I have progressed and built a bit of a name for myself with most of the teams in England, making some huge hits and scoring some good goals! I have also been invited to join up with the GB top guns team to play in Friendly tournaments at International level of play. In doing so I hope to show to other Able Bodied Players that if you set the bar high, you can play with the elite players too! I became involved with the club 3 years ago, through a local event in the Town Park, where Peterborough Phantoms Sledge Hockey was promoting their club and sport. I decided to give it a try there and then and I have been hooked ever since. I suffered 3 major strokes around 7 years ago, which caused me to lose the use of my right side, I lost my speech as well as causing some loss of eyesight. It has been a long road and although I will never fully recover physically to who I was before, the club has been patient and supportive in helping me to get to where I want to be. 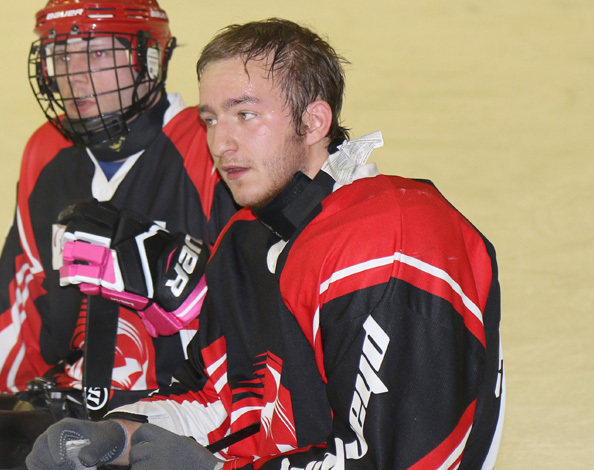 Para Ice hockey is highly addictive, and I love being part of the club. 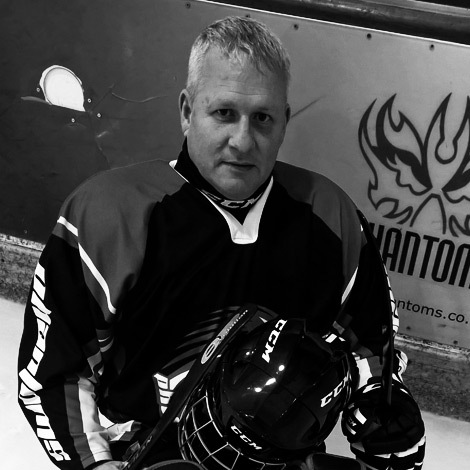 I used to play in defence in football for 15 years before my stroke, however I would rather play Para Ice hockey any day and the only team for me is Peterborough Phantoms! My nickname is the Tank because I’m big and slow, but most importantly I get in the way and tend to “take people out” so others can score! I have always been involved in sport from a young age, starting in wheelchair athletics, and then wheelchair basketball for nearly 15 years. I loved playing basketball, but I wanted a fresh challenge, and so a simple post on Facebook asking for recommendations, brought a reply from a friend telling me to try Para Ice Hockey. What was Para Ice hockey? A quick watch on Youtube showed me everything, it was fast, skilful, scary and I wanted to give it a go! In 2011, I got in touch with someone from the governing body to find my nearest club and my timing couldn’t have been better, because a club was just starting in Peterborough. 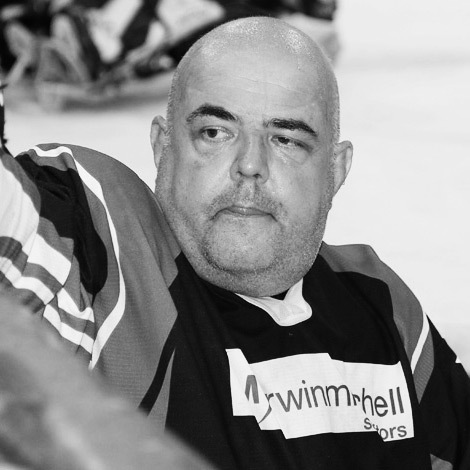 When I turned up, they had no players, no committee and I left that evening having my first experience on the ice, but also being made chairperson – I was left feeling a bit dazed by the whole experience, but I knew in some way it had committed me to getting to grips with this sport and developing the club. From 2011, I was put in the GB development team to fast track me to the senior squad. I was honoured to be called up for the GB seniors in the same year as part of the World Championship squad travelling to Sweden, which allowed me to gain lots of experience. From here on, I have only missed one international competition, and I’m proud to have been part of the squad who achieved a bronze medal in Japan 2013 for the World Championship B-Pool Games. My future aspirations are to keep improving, to help the next generation of players coming through by working to develop Peterborough Phantoms to have a strong future for many years ahead, and helping those who want to play competitively or to just have fun in a supportive environment. 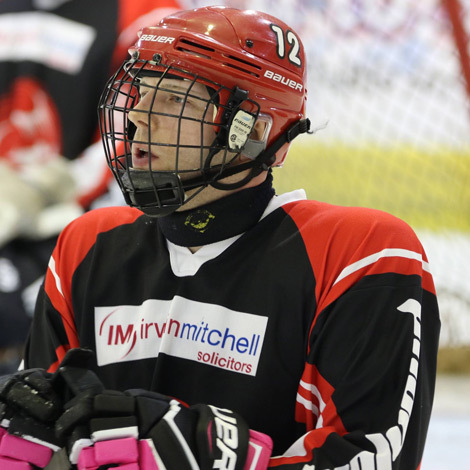 Matt was selected, with 5 other members of the Peterborough Phantoms, as part of the GB Team who travelled to Japan in November 2016 for the IPC World Championships. 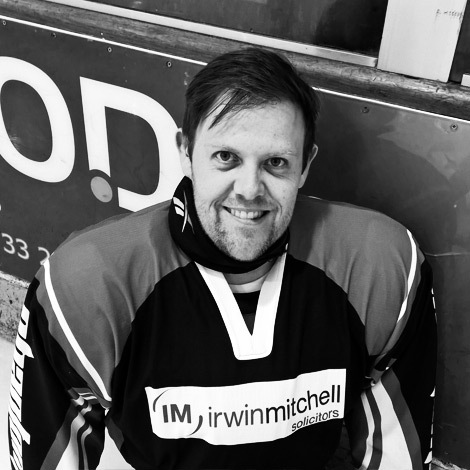 Head Coach Ian Offers, has been involved in the sport of Ice Hockey since 1999 when he watched his first game in Finland, whilst working for Nokia. After years of watching Football, the speed and skill of the sport grabbed his attention. 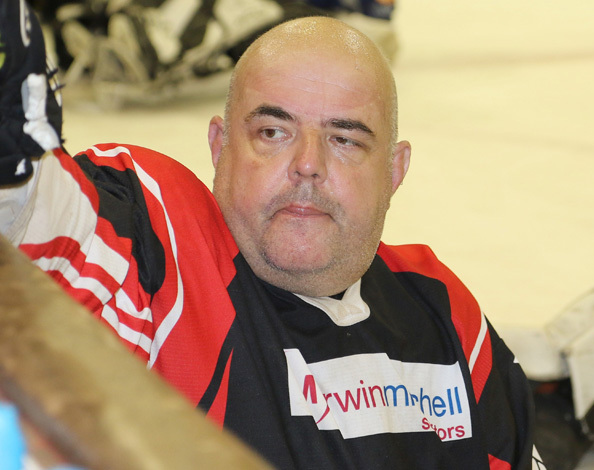 He started working for the Peterborough based Pirates, later to become the Peterborough Phantoms, running their website as well as working on their supporters club and even driving the player’s bus to away games for a number of years. When he was given the opportunity to try the sport his initial foray lasted 2 weeks before he fell and broke his wrist! Once recovered he was back on the ice, signing up to play for the Peterborough Predators. After a few seasons of playing he sat his Level 1 Coaching Qualification as he wanted to give something back to the sport and help new players. After helping coach the Junior clubs Learn To Play sessions, where he taught children aged 4-9, he moved to help with the Under 18s team for 2 seasons. 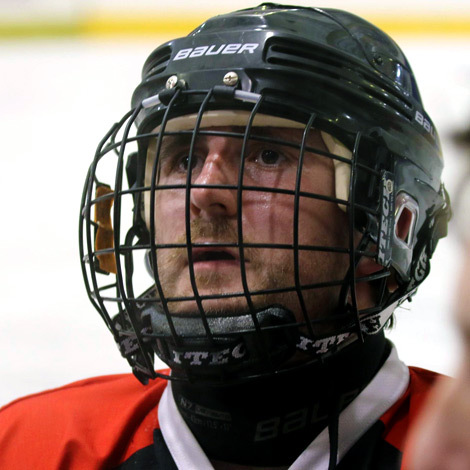 After taking a break from coaching for a few seasons, he returned as Head Coach of the newly formed Peterborough Flyers. The Flyers were an adult Learn To Play team, formed from new players to the sport. At the same time, he was also asked to help with the Peterborough Phantoms Para Ice Hockey team. 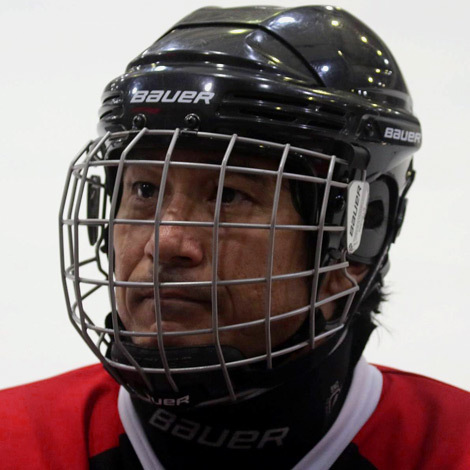 Initially, he said no to Para Ice Hockey, as the sport was alien to him, but after watching a few training sessions he agreed to join the club. 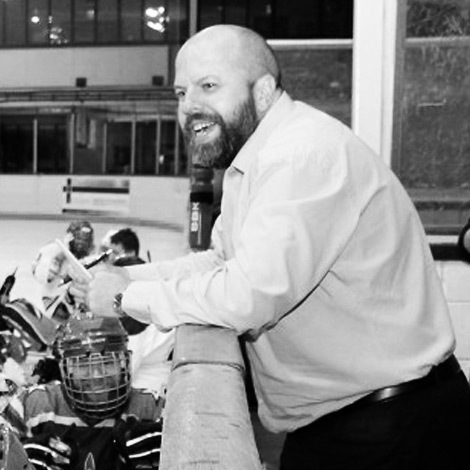 When the then Head Coach left the club, Ian took over what is now the most successful Para Ice Hockey club in the country over the past few years. The Phantoms Para Ice Hockey Club won the League title in 2013, 2014, 2015 and 2016. They have also taken the Play-Off Tournament trophy for the past 3 years that it has been contested. 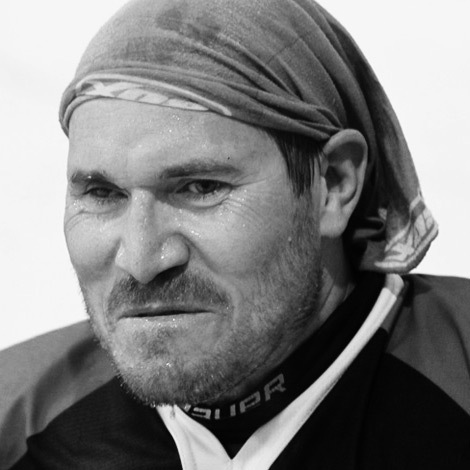 In 2015 he became assistant Coach for the Great Britain Para Ice Hockey Team and also returned to coaching Ice Hockey after accepting an invite to coach Cambridge University’s Women’s Team. 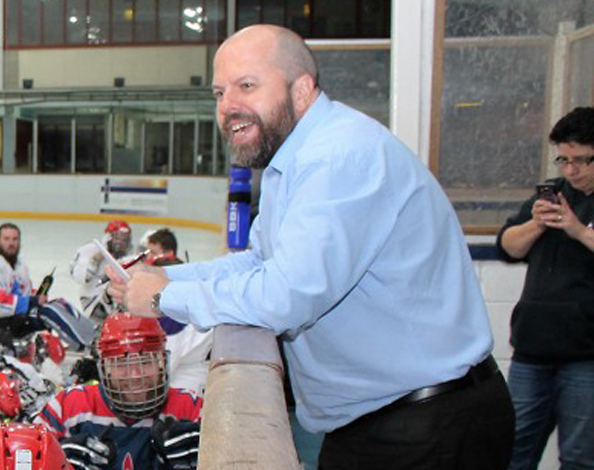 In early 2016 he became the Head Coach of the Great Britain Para Ice Hockey Team and his first International tournament was taking the GB team to Japan in November 2016 for the IPC World Championships. How he has the time for all of this, and a full-time day job, no-one knows, but everyone is grateful that he does !